A workshop under Combating Commercial Sexual Exploitation of Children (CCSEC) Project with civil society organizations, media and service providers for supporting in strategic planning was held yesterday. Social and Economic Enhancement Programme (SEEP) organized the event at a city hotel in capital’s Mirpur. Shohidul Islam, Technical Manager, of CCSEC Project presented the keynote paper while Manotosh Kumar Madhu, Project Consortium Leader (PCL) of CCSEC moderated the program. Md. Fazlul Haque Choudhury, Executive Director of SEEP, Rashida Begum, Child Affairs Officer of Bangladesh Shishu Academy, Abu Zafor Mohammed Hossain, Deputy Manager-Child Led Advocacy of Save the Children, Faroque Alam Khan, Sr. Manager-Operations of Plan International, M A Rashid, Consultant and children of National Children Task Force (NCTF)-CCSEC Club Committee were present, among others, in the workshop. 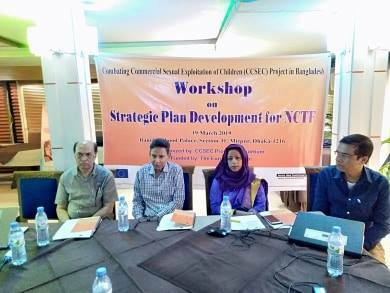 CCSEC projects are being implemented in Dhaka and Tangail since January 2016 with the objective to stop commercial sexual exploitation of children in Bangladesh.